Sevenacres fish Pass is completed Catch per Unit Effort – Further Guidance from Government. The staff all attended the 21st SFCC AGM and Biologists conference at the start of the week and what a good couple of days they were. SFCC goes from strength to strength under the careful management of Sean Dugand. It’s hard to believe Sean has been in post for 6 years now and he’s been a fantastic asset to the organisation and the members. The SFCC aims to raise standards and provide training for members and the sector. Over and above the members trained , SFCC have provided the support and methods that allowed over 400 non members to receive an introductory qualification in electrofishing. They also provide other specialist courses mainly to members but not exclusively. member organisations include 27 Trusts around Scotland, one DSFB’s, SEPA and MSS. During the two day conference we heard from other Trusts on their work, from SEPA on barriers and their classification tools, from MSS on developments in Policy and a new app for recording obstacles and barriers and several more pertinent issues. SEPA’s web portal should assist for anyone wishing to check the status of their local rivers, the problems that exist and the water body classification. ART provided a talk on our approach to practical barrier easements where we presented a novel new way to make and fit baffles at low cost. The concept has been proven and we are about to submit a CAR application to SEPA to ease two difficult barriers at the lower Bogend Burn in Catrine (River Ayr catchment) using the baffles we’ve developed in house. Rarely have we recorded a salmon upstream of these structures, in fact only once I think. Upstream trout migration is bound to be curtailed too so we are keen to trial the new baffle system we have developed and see what results we can achieve. 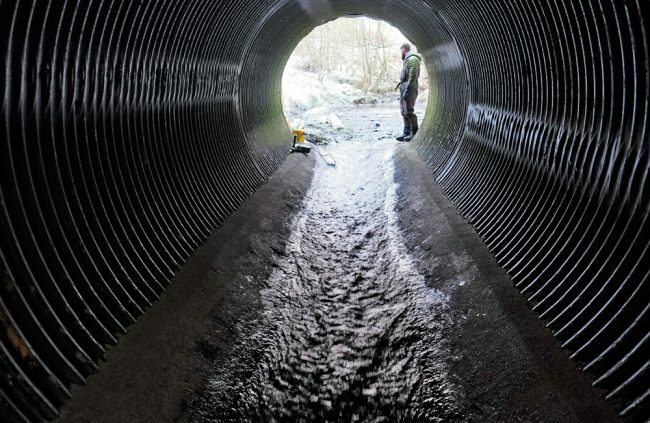 If approved, and found to be successful, this will open the door to other’s involved in fishery management to cut the cost of installing simple baffles in a variety of culverts and obstacle and achieve results for a fraction of the cost of other methods. Cost is always a major limitation when restoring connectivity in rivers. A 35m obstacle to fish migration. It may not be 100% impassible but it most certainly impacts on trout and salmon migration in the Bogend Burn. The bed of smooth concrete offers no resting point over its length and most fish will not manage to swim beyond this point. 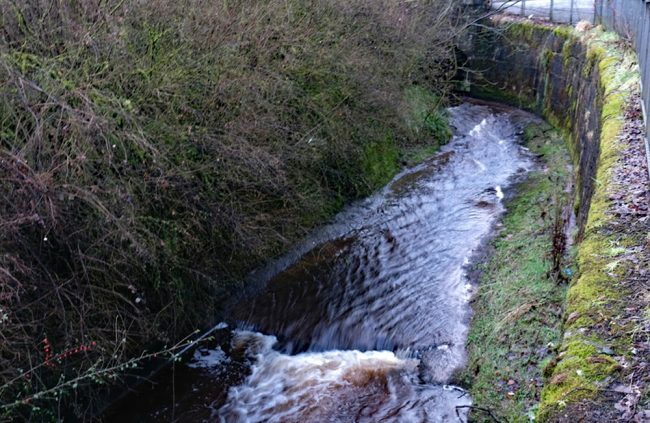 Unfortunately, the responsibility for these culverts lie with Ayrshire Roads Alliance and they are slow to tackle problems under road bridges unless classed as essential maintenance. 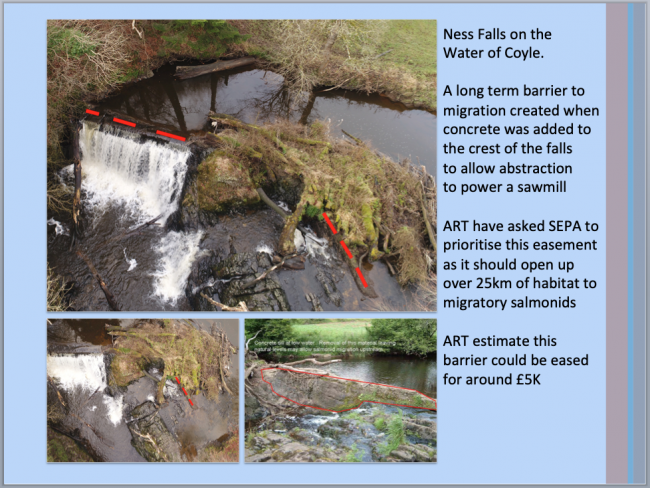 This was highlighted at the conference (by ourselves and others) and there are steps afoot to tighten up on the requirements at these ‘assets’ to ensure fish passage which should help once the changes kick in. In the meantime, if our application for a CAR license from SEPA is granted, we will ease these two barriers in the summer and hopefully see the Bogend Burn’s fish population soar as a result. Elsewhere, we have another new idea that if approved may revolutionise how other types of barriers are eased. Watch this space for more information on both these methods as we develop them into solutions.